Once upon a time, sixty years ago to be precise, I was asked what I would like if I passed the Eleven-Plus Exam, this being the test that sorted out the Grammar School entrants from the Secondary Modern, the potential learners of Latin from those doing Domestic Science. Archaic stuff that formed one's destiny at eleven years of age. One's parents were naturally anxious and prepared to bribe. I said I wanted a Scottie dog. For years I had wanted a Scottie dog. I had a stuffed toy one that I used to haul out for walks on a real lead and who was distinctly the worse for wear as a result. Of course I wanted a Scottie dog. This was not what I was supposed to say, and it was suggested that I would like a new bike, or even more ballet lessons, or a toy theatre with real curtains and lots of glove puppets. Only a Scottie would do. He would be a boy called Mac, and he would have a red collar and lead. So it was (reluctantly) agreed. I would practise the intelligence tests, be sensible about vocabulary (sharp is to knife as sour is to honey/lemon/bread 'Yes, I know you can say lemon is sharp, but stop trying to be smart! '), learn, really learn all the tables including the nine and the seven, brush up on long-division of furlongs, write proper essays about A Day in the Life of a Sixpence, pass the Eleven Plus.....and have a Scottie! Oh, yes, and go to the Grammar School. I passed, but I did not have a Scottie. My parents put up a raft of excuses about incovenience and not being able to find the right dog, and the upshot was that I ranted about their failure to keep a promise, and thoughout the next sixty years I have obviously told and retold this tale of cruel injustice, childhood disillusionment and parental infidelity. 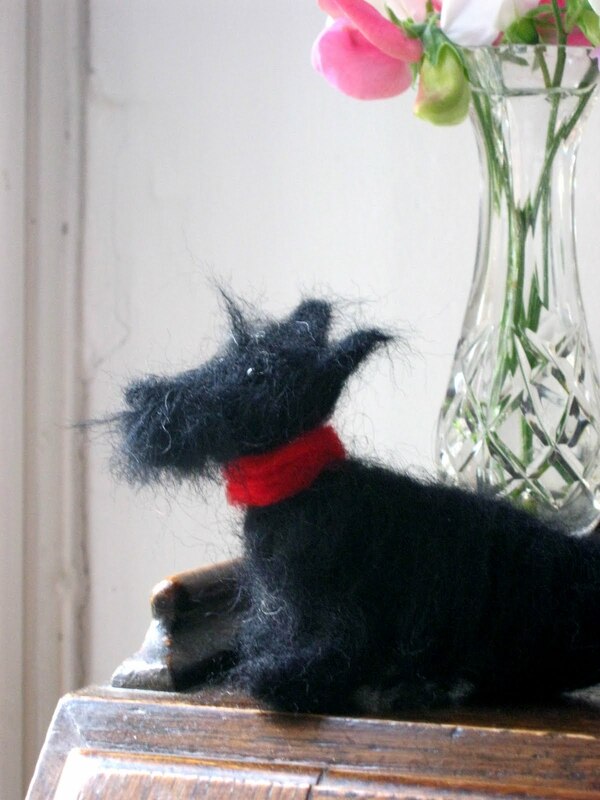 I must have told it more often than I realised, because this morning a Scottie arrived, and you can see him above, clearly on guard in his red collar. 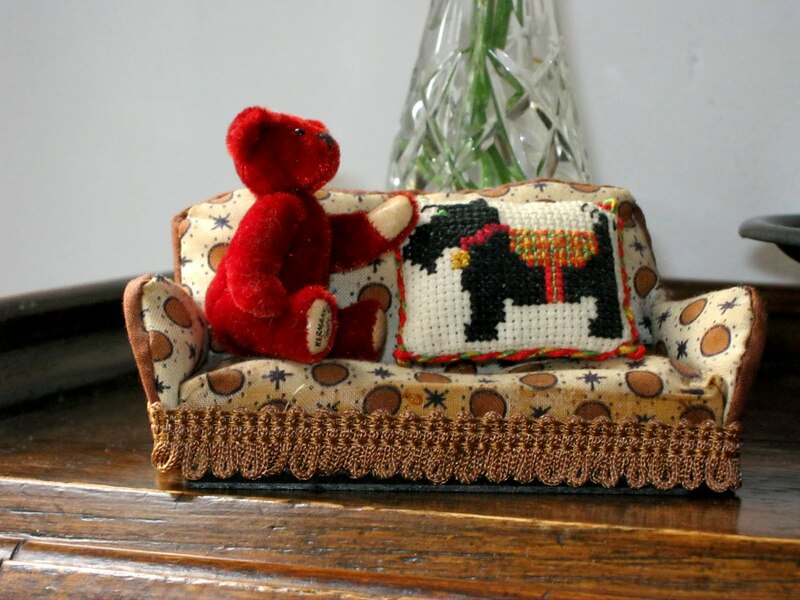 And just to drive home how often I have told this tale, here below is another Scottie, minutely cross-stitched into a tiny cushion in my dolls' house (which is another story to be told). So thank you so much, Jane and Beth, for using your skills and humour to make a sixty year old promise come true! How must that broken promise have altered your view on life! I too remember all that multiplication and essay writing and so on but no promises were made (no money for such things as a bike or anything else at that time though some of my friends did get one for passing) so no promises were broken. I might have wanted something impossible such as a pony anyway so just as well I wasn't promised anything eh?!! So very glad you now have a Scottie (no two) and one that won't require feeding, vets' bills nor taking for a walk each day! So cute! Ah, but one has to learn about the treacheries of the adult world at some point. sigh. I guess you could have acquired a real live Scottie for yourself along the way, but as marigold jam says, they do require much attention and care, unlike your lovely gifted versions. I remember those 11+ questions, and having to go to a strange school to sit the exam. " A Day in the Life of a Piece of Chalk" was the essay question. No promises as mother didn't expect me to pass. I was the only girl *to* pass! ( with six boys) from our school. Promises to children must be made seriously, and always, always kept. You could, of course, keep it to yourself, now. Marigold Jam: My parents took an unwise risk in apparently giving open choice. My own offspring were more likely to have a choice from two or three options - and never connected with passing an exam. I learned a lot from this experience. Leslee: I have nearly had a Scottie several times, but ended up with other rescued dogs in greater need. The treachery was more significant than the Scottie. GZ: Of course, you recognise the technique used for that very clever little model. The Eleven Plus had a profound effect, didn't it? You must have done well with the piece of chalk. Honestly - who thought up those things.... was it was always A Day in The Life of Something or other? Zhoen: Yes, I hope I always made promises that could be kept and threats that I could enforce. We have a new hamster arrival in our house - a reward for good behaviour and good school work for our youngest. I did have a small regret, on the way to the pet shop, that months ago I promised this reward but... given the effort put in to achieve ... a promise is a promise! And Akito (Japanese boys name that means Autumn) is delightfully cute and entertaining! A reward is not the same as a bribe. Or is it? An interesting speculation. Are the cats finding Akito equally entertaining? I once heard of a Scottie called Janet, which seemed to me to be an excellent choice. Not many parents would take the path of breaking a promise to a child. Is it L.M.Montgomery who used the phrase "the iron had entered her soul"? If I had been you, I think that the iron would have entered my soul. Congratulations on choosing the resue dogs. Frances: I don't think there's any iron in me, just an early dose of realism, perhaps. All my many dogs have been second-hand, or more than second-hand, and we hosted a great range of sizes and characters over the years. Oh, that's lovely! I am sorry you didn't get your Scottie when you were little. 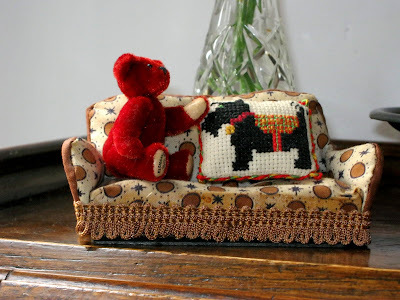 I loved Scotties too, and my parents bought me a toy one which was my constant companion till he was in a fire of all my family's possessions some yeras later. I hope you enjoy your scotties now! Jenny: thank you, and I'm so sorry to hear of the fate of your Scottie with all your family possessions. What a terrible shock. I wanted a dog when I was 7 and was given a budgie. It wasn't the same and I never really loved it, poor budgie. I don't like things to be in cages anyway. I no longer want a dog, though. Isabelle: There's a bit of a discrepancy between and a dog and a budgie, isn't there? I'm sure a dog would be superfluous in your busy life. I'm equally determined not to have another one. PS...11+? My essay was 'A day in the life of bus ticket'! I still rememeber it after 40 years. I may have passed my 11+, but I can still can't spell remember! You know, my partners played that trick on me when I was sitting my 11+ to gain a place at Watford Girl's Grammar School except that they upped the stakes considerably and promised me a pony. I passed my exams. My uncle gave me a 10 shilling note and my parents informed me that the cost of the two uniforms, the books, the hockey stick etc etc meant they could no longer afford the pony. I should have told them I'd go to the local secondary modern instead!